Loni Hancock often joked that, as part of a nuclear family, she was too mainstream for April Coalition counter-culture radicals. Loni was a feminist herself, but this famous 1971 poster got her attacked by feminists, who thought there was more leg than political content. 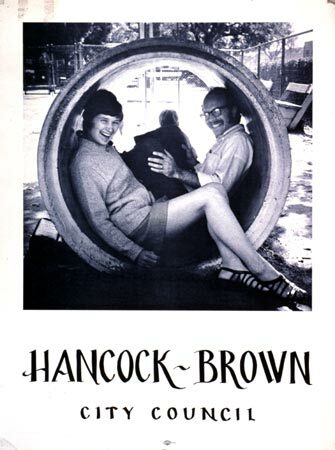 Her running mate Rick Brown is the other person in the pipe. Rick, a University of California (U.C.) graduate student, was the only April Coalition candidate who lost in 1971. Trying to elect a U.C. student to the City Council would prove one of the greatest challenges in Berkeley politics.